This is the first year Nelson Mandela is no longer with us to celebrate his birthday, the 18th July. However his sense of purpose lives on, especially today, as people around the world are encouraged to donate 67 minutes of their time doing something positive for their communities. Yesterday I was feeling a little low, perhaps a touch of the winter blues. In an attempt to pick myself up from the hole I had fallen into I stepped into the kitchen and started baking. I always find immersing myself in the heart of the home does wonders to lift my spirits. The process of cooking requires attention and focus, this immediately re-routes my mind away from my troubles and on to the task in hand. This in turn results in the positive feelings of being productive, the satisfaction of making something and then the warm delight at being able to indulge in the baked recipe! It was indeed a successful kitchen session and my inner glow came back as I melted into the sofa with a cup of tea to accompany my freshly made and still warm, apple, almond and blueberry muffin! This morning my husband left the house for work happy Friday had at last arrived and grinning as he was loaded up with his share of muffins. Then off I went armed with the remaining muffins to give out to those in need. My favourite responses were from the man camping underneath a dustbin tarp who I wave to on my morning dog walk, he was so grateful for his he did a dance. And secondly the lady selling “The Big Issue” who whooped with joy amidst the speeding cars at the intersection as we quickly exchanged money, a copy of the Big Issue and her muffin in 0.2 seconds through my car window before the lights changed! My winter blues were beginning to lift and today was turning out to be a much better day than yesterday but what really reminded me to keep the faith and smile at the wonderfully random curiousness of life was my trip this afternoon to help out with the Chaeli Campaign. A charity that helps children with disabilities. 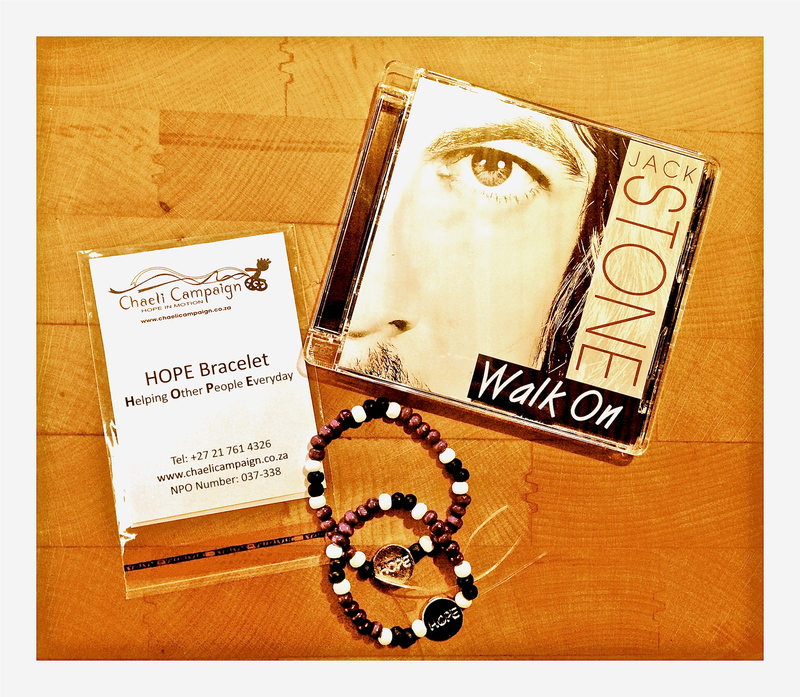 I arrived to sign up and donate my 67 minutes of time to make HOPE bracelets and upon doing so it was announced I was the 67th person to sign up and therefore earned myself a Jack Stone’s “Walk On” CD from the local radio station. To be honest I have never heard of Jack Stone (apologies Jack!) but I shall thoroughly appreciate listening to my new CD and discovering a South African artist. I was then photographed and given a live shout out on the radio for my contribution to the charity. It all came as rather a surprise as I had gone to help the charity not with any expectations for myself but in doing so they truly helped lift my spirits tenfold. ― John O’Donohue. Anam Cara: A Book of Celtic Wisdom. This entry was posted in South Africa and tagged acts of kindness, Big Issue, Chaeli Campaign, hope, karma, love, Mandela Day, Zone Radio by Chasquita. Bookmark the permalink. The quote is so true but most of us don’t take the time or trouble. Chasquita your little star is shining brightly and you deserve every bit of your reward.